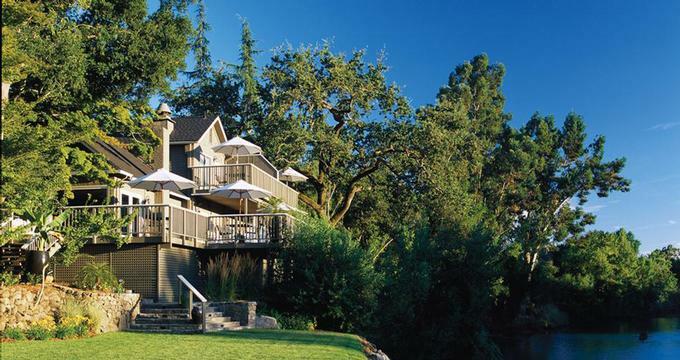 Milliken Creek Inn is a romantic getaway in Napa Valley, offering luxury guest rooms, calm ambiance and a relaxing riverside spa with outdoor treatment cabanas. The property is located on the banks of the idyllic Napa River which adds romance and beautiful scenery to the already exceptional property. Guests are accommodated in 12 individually decorated rooms with king-size beds, down pillows and luxurious linens. Next to your bed, you will find a bouquet of fresh orchids. Canopy beds, fireplaces and the finest linens will surround you with luxury and make you feel pampered from head to toe. Bathrooms equipped with rain showers and oversized hydrotherapy tubs make taking a bath a unique experience. Choose from three types of rooms: Milliken, Deluxe and Luxury. Guest rooms feature lavish king-size bed with down comforter and a spa tub, plus a 42-inch tv and L'Occitane products. Ask for a room with a fireplace for extra romance. Deluxe rooms have romantic river views and a gas fireplace. Luxury rooms are the most spacious with a luxurious sitting area and décor that showcases exotic accents. Ask for a Luxury room with a private terrace or deck so that you can relax with river views. The spa is open only to guests of the inn, offering privacy and a diverse menu of spa treatments. The emphasis is on holistic, therapeutic treatments such as aromatherapy, facials and body wraps. Couples should try the 75-minute couples’ aromatherapy massage or the chocolate mud cocoon. In line with the inn’s philosophy of relaxed living, you will be able to enjoy your complimentary gourmet breakfast anytime you like in the privacy of your room or at the Waterfall Terrace. Guests are invited to the Daily sunset Magic Hour, a reception featuring boutique reserves paired with epicurean cheeses. This is a good place to meet other travelers and swap Napa vacation stories. If you are looking for insider tips for touring the wine country, staff members are always eager to share their favorite spots. The inn is located near award-winning Napa wineries, amazing restaurants and scenic bike paths. Visit Oxbow Public Market in downtown Napa for a delicious take-out picnic, wine and unique shopping. Listen to music at the Napa Valley Opera House which offers a selection of Jazz, classical music and family events. If you are looking for a dream destination for your wedding, the inn offers a several packages that let you tie the knot in an idyllic setting. The wedding coordinator can work with you to customize the packages offered by the hotel. Since the property can accommodate up to 24 people, you can book the entire inn for your special day. The “Finally…and Forever” package starts at $28,000 and includes all the details a couple could wish for, such as massages, hors d'oeuvres, garden wedding, cake, photography and wine reception. The concierge will help you and your guests choose the best wine tours in the area. Room rates start at $550 per night.